What is it – An unusual mix of different flavoured spices all mixed together giving this spice its own individual peppery – sweet taste. Region – Ethiopia, Eritrea, Somalia, Djibouti. 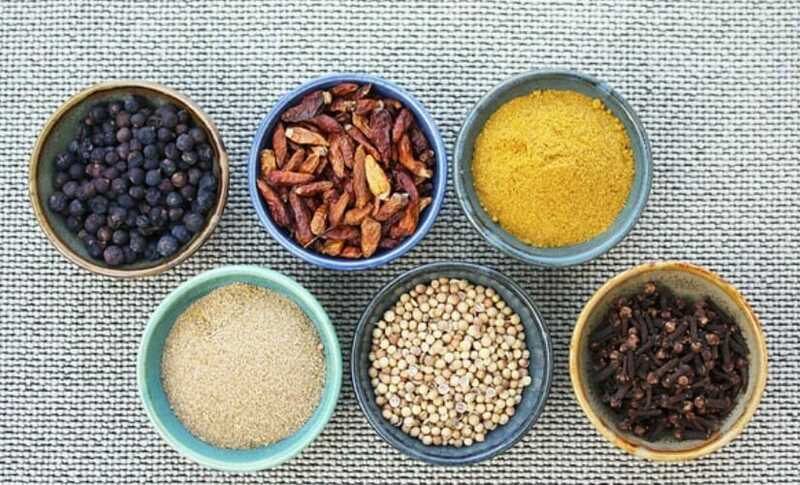 Taste – A blend of hot, sweet and bitter spices gives this African spice blend a perfect balance of flavours! Uses – Mostly used to make stews, soups. Can also be used to make dry rubs for meats, marinates and also as seasoning to most semi-dry veg and non-veg dishes. Taste– Tangy, nutty with a fresh herby tone. Uses – Used as a condiment for making dips mixed with olive oil, adding texture and crunch to meat, fish, chicken tofu. Can also be used as a seasoning for fruits, vegetables, rice, lentils etc. What is it – Most popular found ready-made in jars and pastes, this is the powdered spice version of the hot spicy paste. Uses – Good for rice dishes, couscous, Arabic mezze or just for seasoning at the table. For making it into a paste simply mix the spice mixture with oil. Can be used to enhance soups, stews, appetizers and main dishes. Use it as a marinade for meat and fish. Add it to other dips like hummus or yogurt to give it a depth of flavour. Typical Ingredients – Chili, cumin, coriander, garlic, paprika, salt. What is it – Ras el Hanout means “top of the shop” in Arabic, that is its made with the best quality spices in the shop. Its the go-to spice blend for Moroccan cuisine. A versatile, fragrant spice that goes well with literally anything. Taste– Ras el Hanout is not a spicy spice blend, instead, it has a pungent, warm flavour. Can also have floral note depending on the type of ingredients used. Uses – Used in almost all tagine recipes. Makes an aromatic and fragrant rub for meats and adds flavour to soups and stews. Can also be used as a seasoning for making dips and sauces. What is it – Tabil means “coriander” in Tunisian Arabic. Its a mix of simple spices which makes this an all-purpose spice blend that can be added to many meals and dishes. Taste– Non- hot spice blend with an aromatic earthy warm flavour. instead, it has a pungent, warm flavour. Uses -A versatile seasoning that can be sprinkled on any grilled dish be it meat , veg or fish. Can also be used as an aromatic flavouring for making dips, stews and sauces. Add it to grains and legumes such couscous, rice, beans for added flavour. What is it – An vibrant mix of herbs and spices. The name is taken from the Arabic verb ‘Chermel’, which means to rub or marinate something in spices. Taste– This is not a hot spice. It has a garlicky and sweet spicy taste. Uses -The spice mix is popularly used to marinade fish and as a seasoning for seafood. Traditionally Chermoula comes in a paste form made with fresh lemon juice and herbs. You can add the powdered spice blend with lemon juice and make into a marinade for chicken, meat and fish. Can also be used as a dry rub for grilling. What is it – Piri Piri or Peri Peri is a type of spice and an African word for “chilli”. A very popular spice mix with its own regional variations used mainly for grilling. Spicy, fiery and zesty this mix of spices is sure to tickle everyone’s taste buds! Taste– Hot and spicy with a hint of tanginess. Uses -Commonly used as a spice rub for chicken and meat. It can also be used as a marinade for fish and seafood. Try it as a seasoning to spice up your vegetables especially potatoes. You can also make a piri flavoured dip or sauce.